In addition to the breath taking views, Tarata Fishaway Lodge has lots of things to keep you entertained including farm pets, river swimming, spa pools, Clay bird shooting, ‘magic carpet’ rides, farm tours, spot light safaris and unique trout fishing right at our doorstep. Whether it is by the River on a hot summers day with a book or taking one of the wonderful walks in the valley, there is something special for the whole family and we are just up the valley from Mokai Gravity Canyon Bungy. Paws for a moment & take a break! Our new Dog Friendly Unit is ready and waiting for your loved Dog to come and stay and bring their owners for a special break away. This unit has a king bed and a single in one room. The other room has a kitchenette (toaster, jug, microwave), couch and a TV where your furry friends can also come inside and enjoy. This unit also has a spectacular view with its own decking with a BBQ and bathroom. It has a fully fenced courtyard with a 5 star dog kennel. There is a spa pool on the river’s edge for you to enjoy. 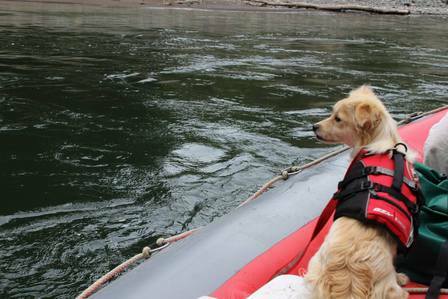 For your thrill seeking dog why not try a Rafting adventure. We are offering a Scenic Raft trip with a BBQ Lunch which is completely dog friendly and a great experience for all. Dog life jacket can be provided (depending on size). There are many places to walk your dog around the property. We do ask that your dog is kept on a lead as we also have dogs but is more than welcome to be let of for a run and a swim down at the river. Our campout raft trips are also dog friendly. With two bedrooms one with a queen bed and the other with a queen and single bed. Also has a spa in the garden. Guests share a guest bathroom and a lounge with an open fire. Meals - 3 course dinner, picnic lunch and cooked breakfast available. The River Retreat is complete with an air-bath with a romantic view of the Rangitikei River, Lounge, Kitchen, Bathroom, second bedroom with king/twin bed, laundry facilities, bbq and a private decking with a spa pool to relax and enjoy the magnificent million dollar views of the Rangitikei River and surroundings. This is peace and tranquillity at its best. The River Retreat is perfect for your honeymoon or that special occasion. Complete with roses and candles and we can deliver a candle light dinner. 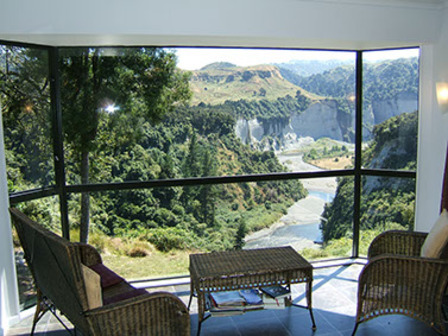 Our Tree House has amazing views of the Rangitikei River complete with waterfall. 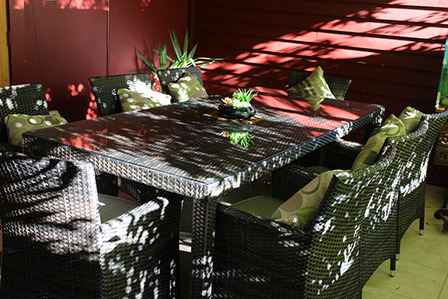 The Treehouse can be booked in three different Units or as a whole. Enjoy a spa on the edge and see the Rangitikei in the moonlight. Perfect for a larger group easily sleeping 10 with a fold out bed for extras and a portacot. Laundry facilities. Our prices include a continental breakfast. 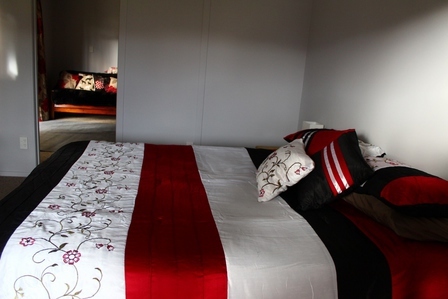 $120-$250.00 double per night depending on your choice of accommodation. $200 - $250 double per night. We Provide all Camping provisions. Licences and flies available from Tarata Fishaway. Ring or email for a Quote to suit your family. per person, picnic lunch included. Looking for something a bit more adventurous? Rafting through gentlegrade 1 & 2 rapids - Feels like grade 3 in the Mini Rafts. 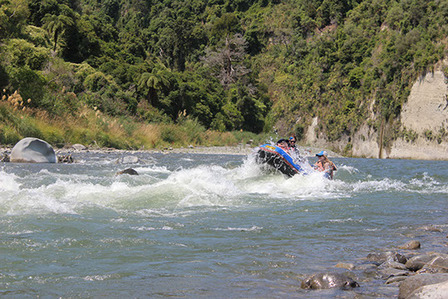 With crystal clear waters, vertical gorges and unbelievable scenery of the Rangitikei River. Turn off State Highway 1, 6kms south of Taihape at the Mokai Gravity Canyon sign. Turn left at crossroads following Gravity Canyon and Tarata signs.